The electric drivetrain and platform of the BUDD-e will see production, but whether it will look more like a Microbus is uncertain. The purely-electric and distantly Microbus-related Volkswagen BUDD-e will see production in the near future, Britain's car magazine reports. The wee MPV that shares its name with a vape pen made its debut at the consumer Electronics Show(CES) earlier this year alongside other "connected mobility solutions," and presented Wolfsburg's vision of what a vehicle with the automaker's Modular Electric platform (MEB) could offer. Volkswagen made no secret of its intention to put the new platform to use, hinting that it would "enable a series production car to have pure electric range on par with today’s gasoline-powered cars by the end of the decade," but stopped short of promising a specific model. But Dr. Volkmar Tanneberger, head of electronic development at VW, did just that in an interview with Car magazine. "You will see a car that looks a lot like this, on the MEB platform, reach production," Dr. Tanneberger said. "I can’t say exactly when, but 2020 or thereabouts." In concept form the BUDD-e houses a 101-kWh battery that takes up almost the entire base of the chassis, with the automaker claiming a range of 373 miles in the New European Driving Cycle (NEDC). The concept itself measures 181 inches in length, making it closer in dimensions to a large upright MPV than an American-market minivan, with many at the CES comparing it to a larger version of the Scion xB. "The basic idea is to develop a modular toolkit and take this flat battery idea into serial production, one motor on the front, one on the rear," said Dr. Tanneberger. Tanneberger also indicated that the Transporter panel van and its passenger version would continue with internal combustion engines, stating that the MEB platform would not displace gas and diesel-engined van platforms entirely. That's a prudent development, as the production version of the BUDD-e would still be a niche vehicle even when it does go on sale. 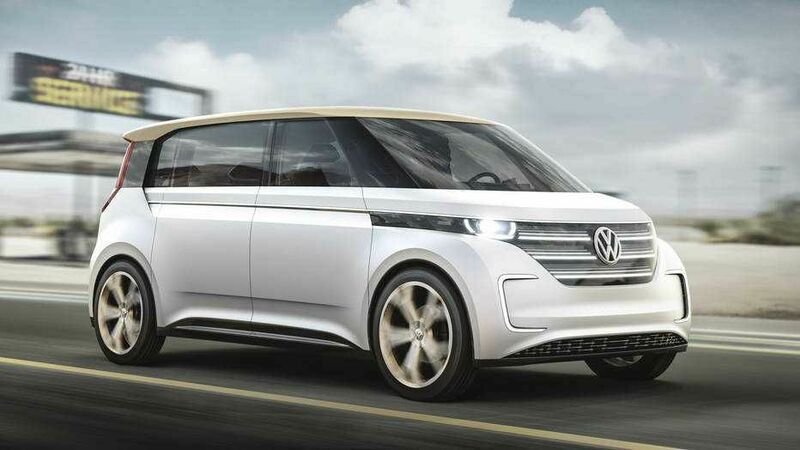 We just wish the production model would look more like the VW Bus.